Growing demand for enterprise and residential cable solutions has been significantly fuelling data center market in Asia-Pacific, resulting in increased demand for structured cabling. Meeting the storage capacity and accessibility requirements has been a daunting job for the data center managers, which in turn creates higher growth opportunities for Asia-Pacific’s data centers structured cabling support companies. India is likely to be the fastest growing country in Asia-Pacific structured cabling market owing to decreasing cost and increasing supply of internet bandwidth, and mission-significant applications of domestic businesses such as ERP (Enterprise Resource Planning) and Customer CRM (Relationship Management) in the third-party data center. These insights on Asia Pacific structured cabling market are from a new study by research firm Fact.MR. Fact.MR anticipates that rising convergence of IoT can be regarded as a progress factor, as leading telecommunications companies and cable operators in India roll out ‘threefold play’ solutions and services. These solutions include the delivery of television as well as broadband internet through a single network. China is likely to showcase significant expansion opportunities for the structured cabling market, with surging usage of broadband services as well as growing investments by foremost industry players owing to potential avenues in the region. 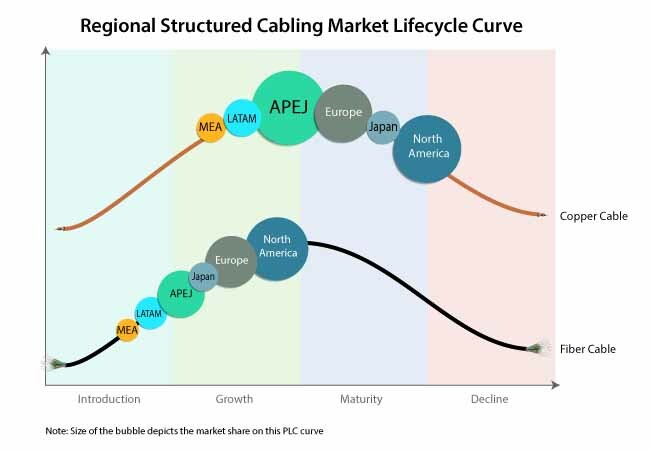 In Asia-Pacific, China and India are likely to hold significant growth avenues for structured cabling market owing to increasing demand for the high-speed internet connections. Growing government initiatives for promoting digitization, increasing adoption of the smart devices, rising population and advanced infrastructure are contributing on a larger basis towards the growth of structured cabling market in Asia-Pacific. In addition, increasing investments in IoT and cloud technologies will further drive the revenue growth of structured cabling market. Internet adoption in the countries such as Japan and China are resulting in increasing number of the broadcast activities, thereby creating lucrative avenues for Asia-Pacific structured cabling market. Fact.MR has also analyzed that structured cabling market at a global scale. Growth of the structured cabling market worldwide is foreseen to record an impressive 7.1% CAGR through2028. Radical changes in the cabling sector has led to shift towards a new phase of modernization that will continue to be the most dynamic factor boosting growth of structured cabling market. This has further resulted in advancements in the manufacturing sector, and emergence of the new business models, in turn creating remunerative growth avenues for the structured cabling manufacturers. North America is likely to dominate structured cabling market during the forecast period. This region has been observing rapidly increasing adoption of the structured cabling systems in all the verticals. The region holds the specialty of early adoption of new and innovative technologies on the back of extensive presence of technology players. Transformations taking place across IT (information technology) have been positively influencing the structured cabling market for various associated technologies. In the forthcoming years, revenues from the industrial and commercial sectors is likely to increase at a significant pace. Growing emphasis on time and cost management, rising competition, requirement for automation of the companies and rising IoT data has been contributing significantly towards demand and supply of structured cabling systems. Structured cabling market is further expected to witness the benefits of the demand for faster data transmission, which enables the enterprises in maximizing profits and improving efficiency of their decision-making. Apart from this, availability of innovative technology infrastructure along with reliable network connectivity is likely to impact the growth of structured cabling market.